CHARLOTTE, N.C., MIES, SWITZERLAND, AND ABIDJAN, CÔTE D’IVOIRE, Feb. 16, 2019 – The National Basketball Association (NBA) and the International Basketball Federation (FIBA) announced on Saturday their plan to launch the Basketball Africa League (BAL), a new professional league featuring 12 club teams from across Africa. The NBA also today announced its plan to introduce a re-imagined direct to consumer offering of NBA games for fans in Africa by the start of the 2019-20 NBA season. The offering would include new packages, features and localized content, with additional details to be announced at a later date. 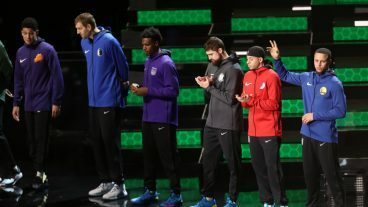 The announcements were made by FIBA Secretary General Andreas Zagklis and NBA Commissioner Adam Silver at the NBA All-Star 2019 Africa Luncheon in Charlotte, North Carolina, in the presence of FIBA Africa President Hamane Niang; FIBA Africa Executive Director Alphonse Bilé; Charlotte Hornets Chairman Michael Jordan; Maple Leaf Sports & Entertainment Chairman Larry Tanenbaum; NBPA Executive Director Michele Roberts; NBA Deputy Commissioner Mark Tatum; NBA Vice President and Managing Director for Africa, Amadou Gallo Fall; and members of the NBA family, including Toronto Raptors forward OG Anunoby (U.K.; parents from Nigeria), Hornets center Bismack Biyombo (Democratic Republic of the Congo), NBA Legend Alonzo Mourning, NBA Global Ambassador Dikembe Mutombo (Democratic Republic of the Congo), Connecticut Sun forward and two-time WNBA All-Star Chiney Ogwumike (parents from Nigeria), and Raptors President Masai Ujiri (Nigeria). The NBA and FIBA plan to conduct qualification tournaments later this year to identify the 12 teams that would represent several African countries, including Angola, Egypt, Kenya, Morocco, Nigeria, Rwanda, Senegal, South Africa and Tunisia, with no more than two teams from the same country able to qualify. The NBA and FIBA also plan to dedicate financial support and resources toward the continued development of Africa’s basketball ecosystem, including training for players, coaches and referees, and infrastructure investment. Additional details about the BAL will be announced at a later date.